“These are players that if you ask Pep today, he will tell you they can and will be first-team players at Manchester City,” Al-Mubarak said, predicting them to make the step up that summer on the preseason tour to the United States. A little less than 18 months later, the excitement over their quality remains, but the chances of any of them making the grade at the Etihad Stadium have seriously dipped. Two, Sancho and Brahim, have already left, and there is concern from some that Foden’s future is being held back by his decision to stay and put his trust in the expert tuition of Guardiola. 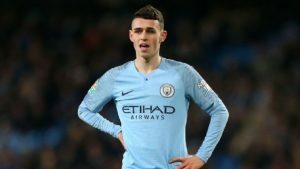 Foden’s fellow academy graduates have decided to shine somewhere other than Man City, but there’s no reason to panic about the 18-year-old midfielder. After all, there are a number of reasons to believe that his breakthrough isn’t far away. Those close to the coaching staff point out that Foden is still young: He doesn’t turn 19 until after the season has ended and is younger than both Sancho and Brahim. Fulham’s Ryan Sessegnon and Wolves’ Morgan Gibbs-White are the only 18-year-olds to make more appearances in the Premier League this season. People inside Man City insist that there are few players at leading European clubs getting as much game time. The obvious exceptions are Sancho, Paris Saint-Germain’s €180 million superstar Kylian Mbappe and 18-year-old Vinicius Junior, who reportedly cost Real Madrid around €45 million.